Chunia devi, 34, and her two sons live in acute poverty in Kadma village in Ranchi, Jharkhand. Her husband, 42-year-old DharamLalMahto, is serving life imprisonment in the BirsaMunda Jail on charges of murder. Until last year, Chunia walked 8 km once a month to take a bus to the prison to meet her husband. She never took her sons along. “I did not have enough money to pay for the bus fare of my sons,” she says. On June 6, 2013, she was informed by the jail authorities that she could talk to her husband without visiting him. She and her family were taken to Pragya Kendra, a computer centre run by the government. There, through video conferencing, they spoke to Mahto for nearly 15 minutes. 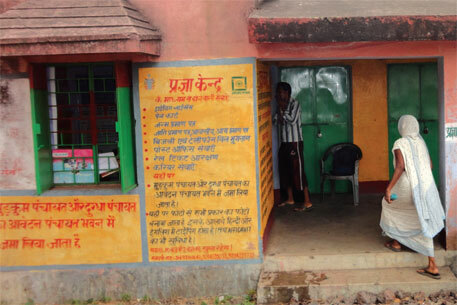 “It was a trial run for e-mulakatto connect prisoners with their families virtually,” Deepak Vidyarthi, assistant inspector general of prisons, Jharkhand, told Down To Earth. The state government’s aim behind e-mulakat (e-meeting) is to save fuel for public transport as well as to avoid crowds in prison. Each panchayat has a Pragya Kendra equipped with hi-speed Internet connection. Since the initiative started in 2012, prison authorities throughout the state have helped scores of families communicate with their relatives in jail without being physically present in the prison. But the process has been slow as the authorities are still working out the logistics of how to inform the families and how much time to allocate to a prisoner. So far, the state has conducted 20 e-mulakats. Chunia, however, is happy. “This process not only saves me money but also a working day. Earlier, I had to spend an entire day travelling to and from the jail,” she says. E-mulakat is not the only initiative to reduce fuel consumption in the state. Authorities started eco-friendly trials, or e-trials, in 2013 with a dual purpose: to save fuel and minimise security threats associated with producing criminals in court. The Information and Technology department of the state maintains an online system in which three prisons can be simultaneously connected with courtrooms through video conferencing. Both the courtroom and prison are equipped with a camera and LCD screen. This eliminates the need for the convict to be present in person during a trial. Home secretary N NPandey explains that all 26 prisons in the state, including five central jails, are suited for e-trials. “E-trials have eliminated security threats that are usually present while transferring undertrials, especially when proceedings involve Maoists,” he says. According to Vidyarthi, in the last two years, Jharkhand has conducted 411,005 e-trials which saved the state at least 20,000 litres of diesel. Vidyarthi points out that before e-trials started, 25-28 litres of fuel would be consumed in the trips made by police vans to the court. Fuel consumption would increase in high-profile cases. “When Lalu Prasad Yadav was produced in court for his role in the multi-million dollar fodder scam, the government had to deploy 30-40 police vehicles, in addition to paramilitary forces. This raised the fuel consumption to roughly 120 litres,” Vidyarthi adds. The e-court project—connecting prisons and courts for trials—was approved by the department of justice in 2007 with a budget of Rs 442 crore. The project targeted 300 jails and 2,000 courts across India. Jharkhand has been a pioneer in implementing the project by not only starting e-trials on a large scale but also taking a step forward and initiating e-mulakat.